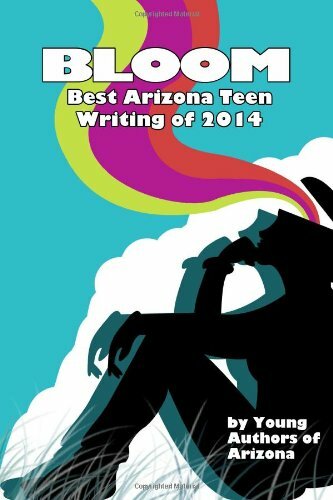 In 2014, 63 of Arizona’s grade 7-12 authors earned publication in Bloom: Best Arizona Teen Writing of 2014. Each year, YAA offers publication opportunities, drawn primarily from Arizona’s Scholastic Writing & Art Awards participants. Welcome to Bloom, the digital version of Young Authors of Arizona’s Best Arizona Teen Writing of 2014 anthology, the first of its kind in state history: by young authors, for Arizona, earned publication through the Scholastic Writing Awards. YAA is the only Scholastic affiliate in America making our own “best of” book, and we continue to make publishing a habit. Grade 7-12 student, if you ask “Can I read that?” “Can I write about that?” “Can we talk about that?” Yes, you can. YAA was created to help young authors show-and-tell language and media arts. We welcome you, the reader, the teacher, the parent, the librarian, the partner organization, the partner business, and especially you, the aspiring young author, to help language and media arts bloom in Arizona by getting and reading the book, as well as “reading” and “writing” the Bloom: Best Arizona Teen Writing of 2014 book site. “Bloom!” Make this print book a dynamic text. Do you know that, combined, Arizona now has over 1,700 middle schools and high schools and many home schools, each with potential storytellers? Media exposure too-often lets the wrong people define Arizona, and Arizonans, so maybe it’s time to create page space for Arizona’s grade 7-12 authors–writers and artists. Focusing on writing in Bloom’s short-term development, the following words show, in snippets and out-of-context, what 63 Young Authors of Arizona have to tell. Click on linked phrases to read the work and participate by creating and using related lesson plans, as well as create and use related works, shared by Young Authors of Arizona for you. Leaking contradictions that send steam rising off asphalt; fireworks that pinwheel across the sky; a spark; smoke ring love letters; Desolation Row; the ugly Christmas sweater; Heaven’s ears; scent of Palo Verde; drawing of a polar bear during recess; three balls to juggle two hands one girl; for who I am and not for who I’m not; blasphemy in the beauty of our fingers intertwined; four-point, thirty-six point, two-thousand, four-hundred point scales; a trophy, a glorified piece of metal; against the rusted fence of the basketball court; hues of lonely blue and shades of bitter belladonna; scowls darting across the room; sardonic interior; the cruel paradox of young men; for La Raza; same way on a zigzagged line; mirror, oh mirror; a rather simple concept; how I feel about myself; chewing bubble gum in the rain; hunched like Atlas and cold like David; eyes like Hera and a voice like Echo; how the other person thinks; just a pat on the back and a few words of kindness; a paper-thin castle made of words; one big chunk of rock floating in space; the stoic stare of glassy eyes; a serpentine wisp of fragile white vapor; haphazardly stitching in hopes of mending; just one last smile; white noise in the TV; War, Poverty, Death, Sickness, Homelessness, Starvation, Dehydration, Helplessness, Greed, Evil, Obliviousness, Cynicism, Deception, Anger, Hatred, Depression, Suicide, Loneliness; nothing like we expected; the end of the Demon’s rebirth; the Bliss of the leaves beneath my feet; unplanted seeds and misplaced house keys; an Arizona sunset; the time you nudged my shoulder with your nose; when sheets of glass rain slandered the asphalt; slowly down from five; no more North or South; all that matters; my twelve years with her; perpetual wave of the naked truth. If you feel the above words don’t merit further reading, I welcome you to close this book/page. If writing by Arizona teens doesn’t belong in your curriculum, ignore this rag and the “punks” that pass notes/text in class. If bored by 63 friends passing paperback notes, then stop focusing and express ur boredom. Try an emoticon: :(. Otherwise, enjoy.